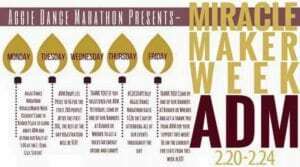 During their first annual Miracle Maker Week, Aggie Dance Marathon at Texas A&M University truly made miracles happen. With their “big event” coming up on Saturday, March 4th, the Aggies ignited passion on their campus that will last a lifetime. Monday: Aggie Dance Marathon hosted a Kickoff on campus to make students aware of their upcoming event and ways to get involved throughout the week. On this day, they revealed their fundraising goal of $100,000. This marks the very first year Aggie Dance Marathon will reveal a six-figure fundraising total to McLane Children’s Scott & White. 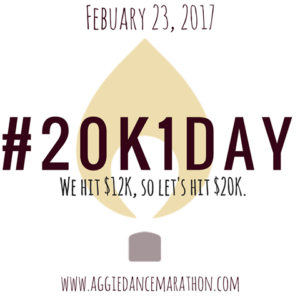 Tuesday: in honor of the six-figure fundraising goal, Aggie Dance Marathon lowered the cost of registration to $6. As a result, 342 students at Texas A&M University committed to standing for 12 hours on March 4th by registering for the Dance Marathon event. Wednesday: Aggie Dance Marathon wanted to focus on thanking the dancers that registered so far this week and preparing them for the upcoming fundraising push day. Thursday: The pinnacle of the week was the Aggies 12 for 12 day where the “12th man” pledged to raise $12,000 in 24 hours. The combination of dancer communication and empowerment alongside an unmatched presence on-campus resulted in Aggie Dance Marathon surpassing that goal and revealing a fundraising total of $20,973.99. Friday: Aggie Dance Marathon hosted an on-campus total reveal and thanked dancers for an incredible week. Magic is happening on this campus and it is contagious. Previous post: McLane Children’s Music Video! Next post: College Students Dance for McLane Children’s!